The Mirage 2000 high-performance fighter delta wing used a design with relaxed stability, a variable-camber (produced by two-section leading-edge slats and trailing-edge elevons) and a “fly-by-wire” computerized con-trol system in an airframe that makes extensive use of composite materials. Developed initially as a single-seat interceptor and air superiority aircraft designated 2000C, the first of four prototypes was flown on 10 March 1978. A company-funded fifth prototype, in tandem two-seat trainer 2000B form, flew on 11 October 1980. The Mirage 2000 was chosen on 18 December 1975 to become the next primary combat aircraft of the Armee de l'Air, to replace the Mirage III is the interceptor role. The first production Mirage 2000C flew on 20 November 1982 with a SNECMA M53-5 rated at 5547kg dry and 8790kg with afterburning, this being replaced from the 38th Armee de l'Air Mirage 2000C by the M53-P2 turbofan producing 6557kg dry and 9687kg with afterburning. Armament consisted of two 30mm cannon with a typical intercept weapons mix comprising two Matra 530D or 530F AAMs inboard and two Matra 550 Magic missiles outboard under the wings. For an attack mission, up to 6300kg of ordnance could be distributed between nine external stations. Deliveries of the initial 37 Mirage 2000C to the first of four Escadres de Chasse began in the summer 1983, this attaining operational capability on 2 July 1984. The dedicated air-defense Mirage 2000C with an advanced electronic countermeasures system, a “look-down/shoot-down” radar, and a mix of air-to- air missiles with infra-red or semi-active radar guidance, with an active radar-guided type to follow, can also be used in the attack role. The 2000C was also produced in a number of differently suffixed sub-variants for export. Mirage 2000C aircraft have flown CAP missions during the Gulf War alongside other coalition fighters. The Mirage 2000 also saw action over Bosnia and Kosova in support of NATO. In 1987, the Dassault company offered a private venture two-phase Mirage 2000 update programme. The first phase, the Mirage 2000-3 with Rafale-type cockpit multifunction displays, flew on 10 March 1988, and the addition of a new central processing unit, an updated head-up display and Thomson- CSF RDY multi-mode radar resulted in the second phase Mirage 2000-5, flown on 24 October 1990. In 1990 a major upgrade of the 37 Mirage 2000C design resulted in the multi-role Mirage 2000-5F which was first flown on 24 October 1990 and was also ordered by Taiwan. The 2000-5 is a multi-role variant capable of using the Super 530D or Sky Flash air-to-air missiles. In 1979 Dassault was contracted to build two prototypes designated Mirage 2000P, later Mirage 2000N. The 2000P was being developed for the low-altitude tactical nuclear strike mission to replace the fleet of nuclear-armed Mirage IVPs. 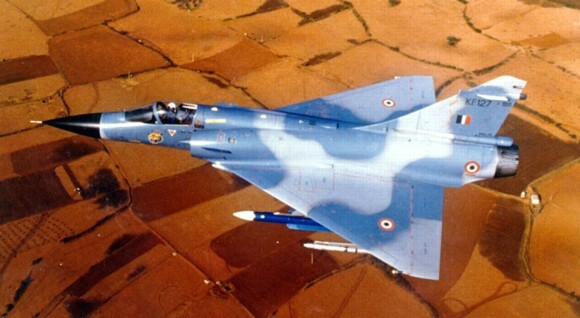 The Mirage 2000N made its first flight on 3 February 1983. Based on the Mirage 2000B two-seat trainer variant, the 2000P has a revised avionics suite and strengthened fuselage for the low-altitude role and the Antilope 5 nose radar optimised for terrain following, ground mapping and navigation and has additional air-to-air and air-to-sea modes. The rear seat is occupied by a WSO which has twin inertial platform navigation systems, a radar altimeter, ECM, a vertical camera, and an additional moving map. The aircraft configured with only the ASMP missile and 2 Magic AAMs is designated 2000N-K1, while the K2 configuration can also carry alternative loads. Lessening tensions in Europe in the late 1980s reduced the need for nuclear capable aircraft and the orders for the Mirage 2000N were reduced to 75 aircraft. Delays with the Rafale program resulted in a need for additional aircraft with a capability for conventional weapons. This resulted in the Mirage 2000D originally known as Mirage 2000N' (or N Prime). Developed from the 2000N-K2 is the Mirage 2000D, equipped with GPS it is developed for the use of laser guided weapons, but is not capable of carrying the ASMP missile. The 2000D-R1N1L is equipped with laser guided weapons and Magic AAMs only, while the R1 configuration can be equipped with the full range of conventional weapons. The R2 configuration is upgraded with a fully integrated self-defence suite and is compatible with the Apache stand-off weapons dispenser. The first Mirage 2000D was flown on 19 February 1991 and the first of 86 aircraft ordered entered service in April, 1993. Mirage 2000D aircraft flew combat missions over Afghanistan equipped with laser targeting pods and laser guided bombs or free fall 250kg bombs. The export model of the Mirage 2000D is designated 2000S, where the S stands for Strike. Mirage 2000-9 is the designation for the upgraded version of the Mirage 2000 export models of the United Arab Emirates. Dassault marketed the Mirage 2000-5 Mk.2 either as a new aircraft or retrofitted from currently operated Mirage 2000Cs or 2000Es. It features an integrated mission system with a glass cockpit, digital modular avionics and enhanced communications. A cockpit development aircraft was designated BX1. To 1990, more than 260 have been delivered, including the two-seat B and N variants, and more than 160 export Mirage 2000s had been ordered by six nations. The Mirage 2000 single-seat fighter export customers included Abu Dhabi (22 2000EADs), Egypt (16 2000EMs), Greece (36 2000EGs), India (42 2000Hs), and Peru (10 2000Ps). At the beginning of 1993, planned Armee de l'Air procurement of the Mirage 2000 totalled 323 aircraft, including 136 single-seat Mirage 2000Cs. Armament: 5000 kg. ext. 9 Pods. Engine: 1 x Snecma M53-P2. Installed thrust (dry / reheat): 64.5 / 95 kN. Initial ROC: 18,000 m / min. Engine: one SNECMA M53-P2 turbofan, 21,385-lb (9,700-kg) reheated thrust. Armament: two DEFA 554 30-mm cannon (125 rounds/gun), up to 13,890 lb (6,300 kg) of disposable stores.